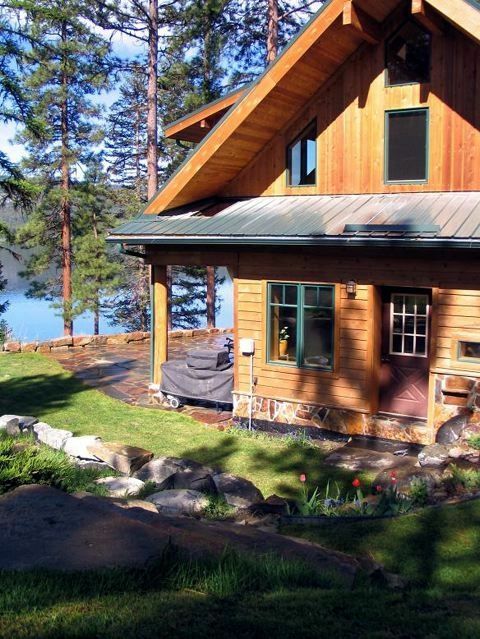 Sample the beauty of Northwest Montana as you retreat to this custom Bitterroot Lake-front house in Marion, Montana. The house sits on one acre and includes 150 feet of private lake frontage, as well as 700 feet of frontage on the adjacent community property - a haven for wild birds and other native animals. Bitterroot Lake is a 3,000 acre lake, located just 20 miles West of convenient Kalispell and 40 minutes from Glacier International Airport. . Designed for efficiency, you will enjoy the coziness of this spacious, smoke-free house which is furnished to sleep up to 8 people. This charming house was designed by the owner, who has college degrees in architecture. Rooms include: three bedrooms (two with lofts), two and a half bathrooms, a family theater/game room, a living room facing the lake, a kitchen opened to the dining room, an office, and an upstairs study desk area. Additional rooms include a laundry room with front-loading washer and dryer, and an outdoor shower with hot water. Amenities include: wood burning stove for warmth or mood-lighting; audio and visual entertainment system, including multi-room and outdoor patio speakers and a large LCD flat screen television (there is NO television service, the TV is for DVDs only; some provided on site) outdoor propane barbeque; a fire pit; and rock patio with adjacent grass lawn. Enjoy the lake in your personal or rental boat that you may put in at the adjacent public boat launch near the Lions Camp. Or go fishing for Kokanee salmon and trophy-sized rainbow trout; enjoy a barbeque with family and friends; and end the evening with a campfire, games around the dining table, or a movie in surround sound. Winter fun activities include ice-fishing, snowshoeing, skate-skiing on the lake, as well as skiing at three different ski resorts (Big Mountain, Blacktail, and Turner) - all located about an hour from the house. In any season, this beautiful lake-house will warm your heart with memories for a lifetime. Basics like salt and sugar are usually there. Paper towels and napkins are sometimes there, but not guaranteed. Loved our stay at this awesome lake house and would stay here again. The house is custom built for a family with kids and has an amazing lakeside view and lake access. The only suggestions: allow guest use of the canoe and paddle boards which would make the price per night more palatable. And stock the kitchen with a coffee grinder or let guests know to bring their own. Great home in a beautiful setting! We loved paddling the lake, which is crystal clear and a perfect size, bird-watching and relaxing on the patio or enjoying the amazing view from inside the house. Private setting on tranquil lake. We thoroughly enjoyed our time here. Our two families had a very nice stay in this home. Beautiful views and all is designed well. Living room area, entertainment room and firepit area were well liked! Angela was very easy to communicate with and we enjoyed our time there. I’m so glad that my home could provide memories your family will cherish. Thank you for the review! Cozy cabin with great lakeside charm. Great little cabin right on Bitterroot Lake with all the charms of a lakeside cottage. Great kitchen with all the amenities of home. The family room has a wonderful view of the lake with a cozy recliner for taking afternoon naps. We will definitely be back. Such a fabulous property. The outdoor spaces of the deck, fire pit area, shore, and side yard were wonderful and the pictures did not give it it's due. It was very private with no neighbors so we could let the kids giggle as much as they wanted! There was a picnic table that got plenty of game use as well as the indoor dining table for jigsaw puzzles. Lots of fabulous family memories made! Kayak rentals were easy to find and fishing was great right from the shore. The home was special, especially loved all the beautiful wood. The living room pull out had a fancy aerobed to it that made it cozy, no bar in your back! Super cute kid sleeping areas, very unique to rentals. We felt very lucky to be able to share this cozy place that the owners obviously had made special for their young ones in their family. My sister-wife and our five children stayed here for a lovely Memorial Weekend. We had a fantastic time. We spent one day fishing by the lake and roasting hot dogs and marshmallows. Another day, we sauntered around Whitefish with the kids and took it easy. The home was beautiful and comfortable! We would definitely recommend it and return again. Check-in is at 4:00 pm Mountain Time and check-out is at 11:00 am Mountain Time. Rates are subject to change until reservation has been confirmed.